Sea Ice News – Call for Arctic sea-ice forecasts, plus forecast poll | Wott's Up With That? 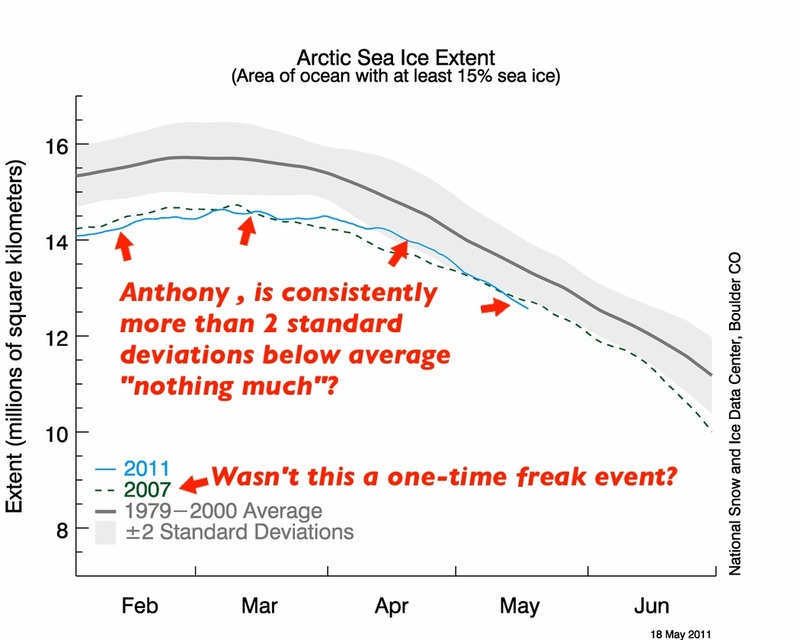 This entry was posted in I Can't Hear You!, Pull the Other One and tagged Arctic, Misrepresentation, Sea ice by Ben. Bookmark the permalink. “it seems intuitive …” ?!!?? My intuition tells me that some people had better find a hidey-hole away from news services pretty soon. Otherwise, the ‘intuition’ explosion will be very ugly when the reports of the vanishing of Sep Arctic sea-ice come out in a _very_ few years. This is a clever poll, as it gives Twatt the perfect get-out… in the (hopefully unrealised) event that the ice extent reaches new lows, *he* can honestly say that *he* didn’t predict otherwise. In fact, *he* has predicted precisely nothing. “Them stoopid commentators /sarc”.